Colonial cool Ethan reached the heights of popularity in the twenty-first century. Thanks to Another for suggesting our Baby Name of the Day. This name means enduring. Fitting for a choice first heard in the Old Testament, where it is worn by more than one figure. Like many a Biblical name, it rose in use following the Reformation. Future farmer-turned-patriot was born in rural Connecticut way back in 1738. Ethan Allen’s parents studied scripture, and chose many of their children’s names from obscure Biblical figures. One brother answered to Zimri, and another to Heber. Allen served in the militia, and ventured into politics. During the American Revolution, he secured the surrender of Fort Ticonderoga. Not long after, the British captured Allen and he spent the remainder of the war in prison. I’m glossing over details – scandalous details – in this chapter of American history. Let’s say that Allen numbers among the patriots, but one of the more complex founding fathers. Nearly a century later, an unrelated man by the same name made guns in Massachusetts. A third took up baseball and played center field in the 1920s and 30s. Edith Wharton’s novel Ethan Frome debuted in 1911, and remains widely read today. Despite a string of famous bearers, the name rarely appeared in the US Top 1000 during the nineteenth century. It disappeared entirely from 1902 through 1951. And in 1952 – the year the name re-entered the US Top 1000 – the US Air Force named a base in Vermont after the patriot. Credit the Wild West with the name’s resurgence. In 1956, John Wayne starred in The Searchers. He played Ethan Edwards, a soldier returned home to his Texas. When his young niece is kidnapped by the Comanche, he sets off to rescue her. The movie made a splash in 1956, and has since become a classic. It’s among the greatest Westerns of our age. 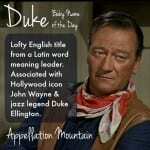 In 1962, Wayne named his youngest son after the character. The Searchers bumped the name up, but it doesn’t explain everything. Actor Ethan Laidlaw’s career started way back in the 1930s, but he picked up many a small role on television Westerns in the 1950s and 60s. That, combined with the new Air Force Base, might explain the name’s early rise. The name gained steadily from the 1960s in the 1980s. And then it soared, leaping from #262 in 1988 to #87. It has remained a Top 100 staple ever since. First, CBS debuted Guns of Paradise in 1988. It rans for three seasons, telling the story of gunfighter Ethan Allen Cord, who suddenly becomes ward to his orphaned nieces and nephews. The show enjoyed critical acclaim and built a loyal fan base – more than enough to boost a name. And then came Ethan Hakwe. Hawke’s breakout moment came in 1989’s Dead Poets Society. He went on to star in more movies, earning Academy Award nominations along the way. When the Mission: Impossible television series was reinvented for the big screen in 1996, Tom Cruise became an IMF agent named Ethan Hunt. Hunt has headlined five movies to date, with another one in the works. The 1996 release of the first blockbuster movie tracks with another big jump in the name’s use. Countless fictional and real bearers of the name followed. In 2002, the name entered the Top Ten. More than a dozen years later, it’s still there, though down a bit from a peak of #2 in 2009/2010. 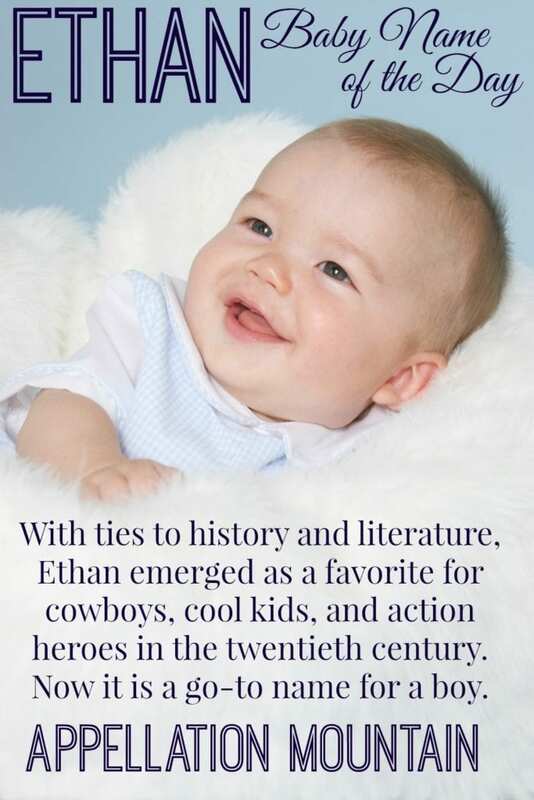 With a mix of history and literary ties, plus a man-of-action vibe, Ethan is likely to remain a favorite. What do you think of this name? Would you consider it for a son? This post was originally published on October 17, 2008. Following substantial revision, it was reposted on November 7, 2016. The first Ethan I ever met was my high school best friend’s father. Given that he would have been born in the 40s, it was a pretty unusual name for a dad at the time to have. It was positively YEARS before I met another. I always thought it would have boomed in the 90’s rather than the early 00’s. There were a few Ethans and a lot of Lathams and Nathans when I was in primary school. There was totally a ‘th’ boys name thing right before an ‘ayden’ thing. Anyway, it sounds extremely 90’s to me, like Amanda or Kyle. Ethan isn’t really my thing as I’m not fond of the ‘th’ noise but thats just a personal thing. I’m not so used to hearing Ethan as you guys because he isn’t quite as popular over here. Although I have just checked and was slightly surprised to see that he is currently ranked 15th and has been in the top 20 for the last 5 years (I can’t check any further unfortunately). 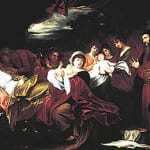 I was interested to hear what Verity was saying about the passion for Biblical names that Americans associate with Colonial America – and that in the States, Ethan would be a likely sibling to a Hannah or Abigail, Luke or Nathaniel. Speaking generally, the UK is neither as religious nor have we experienced the trend for old Testament Biblical names on any great level. As a result, Ethan feels much more like a modern naming choice here and I think this would be reflected in his likely siblings names. A UK Ethan would be more likely to be the sibling of an Aiden, Dylan or Jack (everyone has a Jack! ), Mia, Chloe or Keira than the aforementioned American options. My son is also Ethan James. There is 1 other Ethan in his school (but it’s a small school). I don’t know; I keep hearing how popular the name is, but in the three states we have lived in since our Ethan was born (he turned two today) my husband and I have yet to meet another Ethan! I knew several my age, but haven’t met any younger than I am and have yet to meet any playmates for my Ethan. We love it (obviously). When I started thinking about it as a contender for my son, it sounded preppy, clean, not trendy. We didn’t check the popularity stats – but all of my other pregnant friends were having boys that year and no one else chose Ethan, so we were happy to snag it. Anyway, that’s my boy, Ethan James – solid, reliable, preppy, classic, (not a trend!). My son’s name is Ethan. He was born in 1995 when the name was not very common but not unheard of either. When he was younger (before Ethan became popular) people often misheard his name as Ian, Nathan or Steven. Some people related the name more to Ethan Allen furniture than the historical Ethan Allen. Though now there are Ethans everywhere I don’t regret the choice. He likes his name. Ethan’s okay with me. I mean, I don’t like him enough top use him myself but Ethan beats Matthew in my book. Similar sounds, different feel. Crisper, sharper & more suave vs. Tired, sort of bland and desperately in need of rest. […] not to love about Asher? […] you’re looking for a first name for a son, Eames is less French than Yves, less expected than Ethan. […] mix makes the name strangely appealing. […] All of this makes Caleb terribly attractive, and fits right in with plenty of great names, like Ethan and Nathaniel. […] who answered to Bo. […] not in the US? […] Real is on a roll. […] of the Day: Isannah 19Oct08 A few days back, we discussed colonial cool Ethan.